The Nevada Field Office (NFO) of the NNSA opened the Coordination and Information Center – now referred to as the Nuclear Testing Archive – on July 17, 1981, to collect and make available all historical documents, records, and data dealing with radioactive fallout from all U.S. testing of nuclear devices. The Nuclear Testing Archive collects and consolidates historical documents, records, and data for long-term preservation. The collection includes documentation on the detection and measurement of radioactive fallout and the related factors resulting from nuclear test device activities at the Nevada National Security Site (NNSS), the Trinity event, the Pacific Proving Grounds, and other on-continent test locations, as well as information on the health effects of radiation and various related scientific and technical studies and reports. This collection of over 386,000 documents is available to the public through use of the Nuclear Testing Archive Public Reading Facility. This facility maintains more than 40,000 documents relating to Human Radiation Experiments by our predecessor, the Atomic Energy Commission (AEC), as well as over 346,000 documents dealing with the U.S. nuclear testing program. The bibliographic information for the collection at the Nuclear Testing Archive can be accessed through OpenNet. OpenNet is the DOE's bibliographic database containing declassified and publicly available documents. It is an automated searchable database, which enables the interested stakeholder to identify documents of interest, determine their location within the DOE complex, and obtain ordering information. The Nuclear Testing Archive also maintains the complete DOE Human Radiation Experiments collection. These documents are available in full text retrieval through DOE Human Radiation Experiments site, above. Normal library services, such as assistance in locating documents, are provided at no charge. Other services, such as copying and proxy research by staff, will be provided according to a fee schedule. The Nuclear Testing Archive has approximately 100 unclassified historical nuclear weapons testing videos. To obtain a list of videos, please contact the NTA at cic@nv.doe.gov or by phone at (702) 794-5106 or 1-877-DOE-FILM (1-877-363-3456). The NNSA NFO maintains information relating to the nation's nuclear testing program, the NNSS, environmental monitoring and restoration, and waste management. Much of this information is already publicly available through use of the Nuclear Testing Archive and the Public Reading Facility. 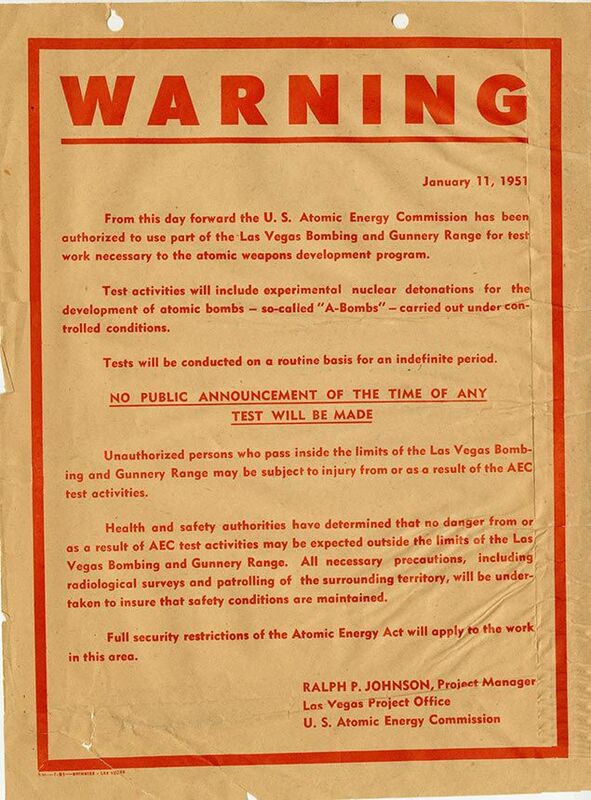 The Nuclear Testing Archive maintains over 370,000 documents related to the U.S. nuclear testing program and the Historical Nuclear Weapons Test Films, as well as the complete collection of Human Radiation Experiments documents, available online in full text retrieval from the Office of Human Radiation Experiments. As mandated by the Freedom of Information Act (FOIA), documents already in the public domain may be viewed at the NNSA NFO Public Reading Facility, located at 755 East Flamingo Road in Las Vegas, Nevada. $2.00 for CD-ROM, plus shipping and mailing fees where applicable. Other services not listed above will be considered on an individual basis and will be charged at actual cost. Nuclear Testing Archive may establish an estimated cost and may require a deposit before the request is processed. All fees must be paid before the documents are released.